E3 used the Pathways Model to develop multiple scenarios that can achieve deep GHG reductions by 2050. To assess the cost and feasibility of potential GHG reduction targets for 2030 we developed three timing scenarios that vary the rate at which low carbon technologies are deployed, and compared them to a reference case in which no further policies were adopted. The E3 PATHWAYS model for deep decarbonization scenarios is a tool for GHG mitigation planning that evaluates long-term GHG abatement scenarios and performs cost analysis. We developed PATHWAYS in 2008 to identify feasible combinations of GHG emissions reduction measures across multiple sectors of the economy. It is a “stock-and-flow” model that considers replacement cycles for buildings, vehicles, appliances, and other infrastructure through 2050. Given the electric sector’s central role in deep decarbonization, PATHWAYS includes a detailed, hourly representation of electricity system supply and demand as well as transmission constraints on electricity flows. The model tracks energy and infrastructure costs and calculates GHG emissions based on energy demand and supply choices. 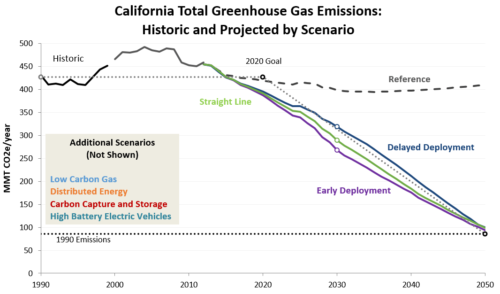 We are currently using PATHWAYS to inform the California Air Resources Board’s update of its scoping plan, the economy-wide blueprint for achieving California’s SB 350 goal of reducing GHG emissions to 40 percent below the 1990 level by 2030. For the 2015 United Nations Climate Change Conference (COP 21) in Paris, E3 was one of 16 country teams selected to independently model pathways for long-term GHG reductions as part of the Deep Decarbonization PATHWAYS Project. We used PATHWAYS to develop long-term GHG reduction scenarios for the U.S. Each team demonstrated that an 80 percent GHG reduction is feasible with existing technology at a cost of approximately 1 percent of GDP for most countries. In 2014, E3 used the PATHWAYS model on behalf of the heads of California regulatory agencies and the California ISO to evaluate the feasibility and cost of potential 2030 targets along the way to the state’s goal of reducing GHG emissions to 80 percent below 1990 levels by 2050. We developed scenarios for the pace at which the state can achieve reductions as well as the mix of technologies and practices it needs to deploy. In 2012, we used PATHWAYS to analyze the technology path to deep GHG emissions cuts by 2050. The landmark study, subtitled “The Pivotal Role of Electricity,” appeared in the journal Science. PATHWAYS evaluates long-term decarbonization scenarios and performs cost analysis to support GHG mitigation planning. For more information about PATHWAYS, contact Snuller Price or Amber Mahone.